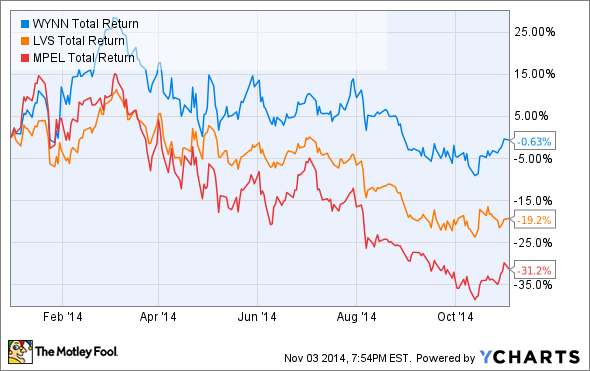 2014 has shown how much risk there is in gaming stocks, and there are three reasons one stock could continue to fall. Gaming stocks have underperformed the market in 2014, and Wynn Resorts (NASDAQ:WYNN) stock has been no different. A slowing gaming market in Macau has made investors skittish about buying into even the industry's best stocks and the sell-off has been widespread. There's no way to know for sure whether a stock will go up or down in the future, but here are the three biggest reasons Wynn Resorts' stock could continue to fall over the next year. The immediate problem in Macau is that VIP gamblers have simply stopped coming to the Chinese special administrative region. A crackdown on corruption in mainland China has made business owners skittish, and it's likely that corrupt money was flowing into Macau's casinos. Industry executives like Steve Wynn and Las Vegas Sands' (NYSE:LVS) Sheldon Adelson seem to believe it's only a matter of time before VIP gambers come back, but what if they're wrong? Macau's gaming market has become inflated to over $47 billion per year, and that might not be sustainable unless China's economy grows significantly. The last year or two years of growth may have been an aberration more than the new norm. A permanent reduction in VIP gamblers would be a drag for Macau and especially Wynn Resorts, which caters to this high-end clientele. Wynn Palace is Steve Wynn's $4 billion bet on the Cotai region of Macau. Image source: Wynn Resorts. Alongside short-term pressures on Macau's gaming market, which include the corruption crackdown and a limitation on visas to gamble in Macau, the long-term risk is a slowdown in China's economy. Macau has benefited from a rapid increase in high-end wealth in China, but recently the mass market has driven both growth and profitability of casinos. There's evidence, though, that China's economy is slowing and could come to a screeching halt if a growing credit bubble bursts. A slowing Chinese is a huge threat to Macau, and not just the VIP market. The mass market now represents 40% or more of Macau's gaming revenue, and more profit is coming from the mass market than from VIPs. If the economy slows those middle-class players will stop making regular trips to Macau, and that could crash Wynn Resorts' stock. Steve Wynn plans to spend $4 billion to build a new resort in Macau and $1.6 billion for a resort near downtown Boston. With so much money involved there's a risk he won't be able to execute on the resorts as planned. Building in Macau comes with a number of problems, including getting labor for construction and then workers for the resort's operations. It's not unusual for a resort of that scale to be delayed, but Wynn hopes to have Wynn Palace's doors open by Chinese New Year 2016. Missing that mark could mean hundreds of millions in lost revenue. Wynn Everett is the latest project to get the green light for Wynn Resorts. Image source: Wynn Resorts. To put the potential loss from Chinese New Year alone in perspective, Macau's gaming overall revenue in February 2014, which encompassed, jumped 32.3% from a month earlier to $4.76 billion. That monthly level has not been hit since and is 24% higher than the average month this year. So there's a lot at stake in hitting an early February 2016 opening for Wynn Palace. There's also a risk that Wynn Palace isn't allocated the more than 500 gaming tables the company has requested. Table games are allocated basically as the government sees fit; while Steve Wynn doesn't see a problem getting his cut, more than one executive in Macau thinks they're in line first. Las Vegas Sands will complete The Parisian before Wynn Palace is done, and Melco Crown's (NASDAQ:MLCO) Studio City is expecting tables despite not being approved for gambling yet. Not receiving the 500 anticipated tables could be a huge loss for the new Wynn resort. The Boston resort (to be built on the site of an old chemical plant) is probably the most challenging construction project Wynn has ever attempted. There's certainly a risk that the $1.6 billion price tag will balloon, making it difficult to recoup the investment. Wynn Resorts has a lot of projects to execute on over the next three years; failure to do so flawlessly could be a hit to the stock.